Trade in your old device for a credit towards a new computer! 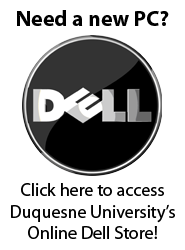 Owned and operated by Duquesne University, the DU Computer Store is a vital non-profit resource available to all Duquesne students, faculty, staff, and alumni. Using our buying power and technological expertise, we help provide the perfect solution at a competitive price. Our store is conveniently located on the second floor of the Student Union. Stop by today and view our broad selection of merchandise! Due to limited space, we cannot stock all available items; however, we can backorder special request items. Ask our friendly staff if you do not see the products you need.